Peek at your PC on the cheap. Thermaltake sells plenty of excellent PC cases, like the affordable Core V1 that is used in so many small form-factor PCs (including my own system). 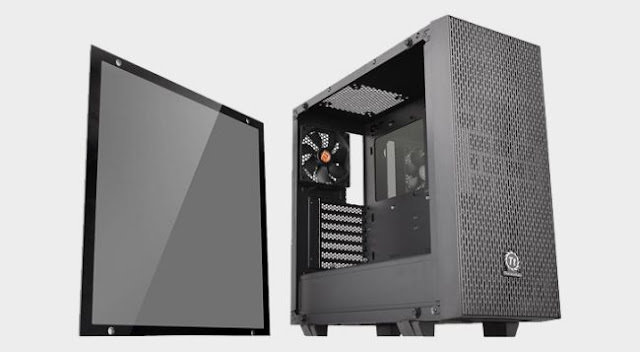 Right now you can get the Core G21, a great mid-tower case with two tempered glass side panels, for just $29.99 after a $25 mail-in rebate. The Core G21 has dual 4mm tempered glass panels, with the back panel being darker than the front window. It also has a full-length PSU cover, two USB 3.0 ports on the top I/O panel, and modular drive brackets. You can use three 120mm fans (or two 140mm) on the front, one 120mm fan on the back, and one 120/140mm fan on the top. You can buy the case on Newegg. The listed price is $54.99, but with the mail-in rebate, the total cost comes down to $29.99.